Indian police investigating the Bombay train bombings have made their first arrests, picking up three men who officers said Friday were linked to terror networks across South Asia. All three suspects were picked up Thursday, and "we have definite evidence that these people are linked to terrorist activities," one of the lead investigators, K.P. Raghuvanshi, told reporters Friday. "They have connections with groups in Nepal and Bangladesh, which are directly or indirectly connected to Pakistan." Pressed for details, Raghuvanshi would only say: "We will place the evidence before the court." But he said more arrests were expected soon, noting that the plotting for the bombing of seven trains, which killed 207 people and wounded more than 800, was "a big conspiracy." He identified the men as Khaleel Aziz Sheikh, Kamal Ahmed Ansari and Mumtaz Ahmed Chowdhury, correcting names given in earlier police reports. The first two were arrested in the eastern state of Bihar, the third was nabbed in Bombay. None have yet been charged. 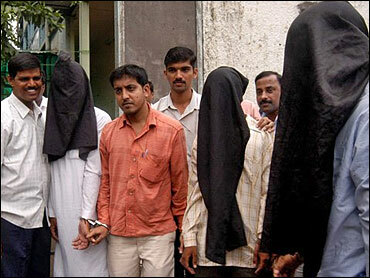 Wearing black hoods over their heads, the three were brought earlier Friday to a court in Bombay. There, a judge ordered the three — their hoods taken off inside the courtroom — held in custody for 10 days. Investigators have detained hundreds of people across the country for questioning since the July 11 bombings, but these three are the first to be formally arrested. Police and officials have repeatedly suggested Islamic militants fighting Indian rule in Kashmir — namely the Pakistan-based Lashkar-e-Tayyaba — are behind the blasts and have accused Pakistan of involvement. Kashmir is a predominantly Muslim Himalayan territory divided between India and Pakistan, but claimed in entirety by both nuclear-armed countries. Pakistani President Pervez Musharraf vehemently denied any Pakistani role in a televised speech Thursday. "I want to tell the people of Bombay that the reaction of the Indian government to the blasts was strange," Musharraf said. "There should not be any blame game. There should not be unsubstantiated comments." "I want to assure the government of India that Pakistan will cooperate with it to identify the terrorists, if you give us proof. We will remain with you on this issue," he said. The arrests come a day after a top official in Maharashtra state, of which Bombay is the capital, said security across the state had been tightened amid threats of more terror plots. Intelligence reports indicate that houses of worship, historical sites, business establishments and places where large crowds gather could also be targeted, said A.P. Sinha, a top official in the state's Home Ministry.